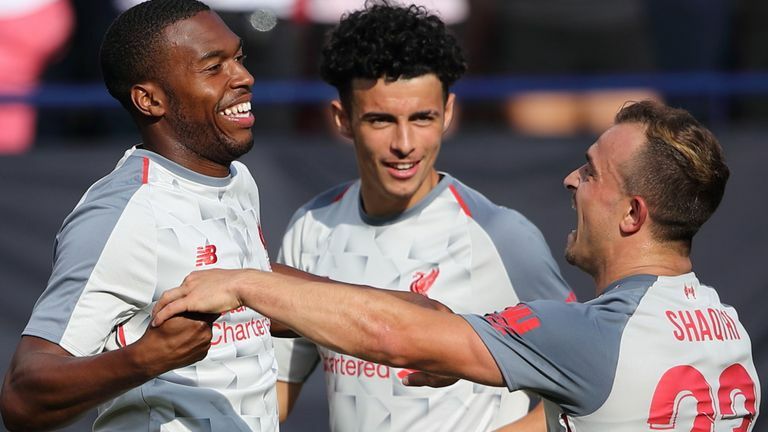 Liverpool thrashed Manchester United 4-1 in the International Champions Cup on Saturday as Xherdan Shaqiri capped his debut with a memorable goal. This was a pre-season friendly in name only as over 100,000 fans in Michigan were treated to an intense clash played at a competitive pace for the majority. Sadio Mane got things rolling with a first-half penalty (28) after Mohamed Salah had been fouled but United youngster Andreas Pereira (31) levelled with a wonderful free-kick - one of just three shots on goal mustered up by Jose Mourinho's team. Shaqiri was introduced at the break for his first appearance since joining from Stoke City and set up Daniel Sturridge (66) to give Liverpool a deserved lead. Sheyi Ojo scored from the spot (74) before Shaqiri wrapped up the scoring with a spectacular overhead kick.